Having lived both in New York City and Southern California, I've seen my fair share of celebrities: Chris Rock, Kristin Chenoweth, Jim Parsons, Sean Hayes, Bernadette Peters, and Jesse Tyler Ferguson, to name a few. I'm still not used to passing a celebrity on the street, and I always get pretty excited when I do. So when I crossed paths with this guy twice just a block and a half from my office, I wanted to start dancing. 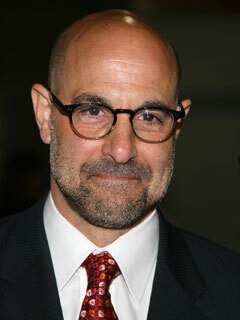 For those of you who don't recognize him, that's Stanley Tucci, one of my favorite actors. I adore him in everything - he's so quirky, fresh, and hilarious, and he always manages to capture my heart. And his chemistry with Meryl Streep is off the charts. Anyone who can steal a scene from the phenomenally talented Ms. Streep is just fine in my book. This particular celebrity sighting seemed very apropos considering our Hunger Games discussion from last week (which was amazing - I loved all of your insightful comments and finally had time to respond to them all!). 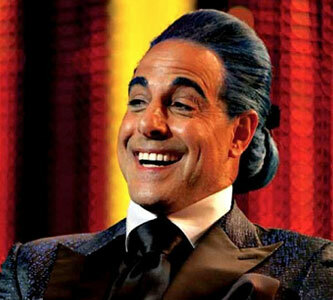 I cannot wait to see Mr. Tucci transformed into the delightful Caesar Flickerman this Friday. Do we all have our tickets? The actual story of how I saw Mr. Tucci is a little boring. I was doing a late-afternoon FedEx run when I passed by this cute little French bakery right around the corner from my office. I glanced over and saw a man who looked oddly similar to Stanley Tucci. I think my actual thought process went a little something like this: "Wow, that guy looks an awful lot like Stanley Tucci! I mean, he's got the bald head, the peppered beard, the awesome round glasses. They look so similar. Oh wait - that is Stanley Tucci!" When I passed him again on my way back to the office, I snuck another peek just to be sure. And yes, it was definitely Stanley Tucci. Day = made. Have you ever seen any celebrities? 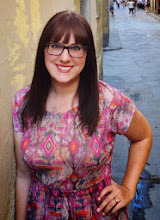 I'm dying to hear your stories! Stanley Tucci is an awesome celebrity sighting! And talk about timing. My best sighting was Russel Brand, I used to work across the street from Grand Central in NY and saw them filming the scene with the top hat from Arthur. I feel like that sighting is kind of cheating though, because they were filming and it wasn't a truly random sighting. Plus I think Tucci is way more awesome. I love his conversations with his adopted son in Easy A.
I know, right? Stanley Tucci is seriously the best. I adored him in Easy A (and just about everything he does), and it was really cool to see someone who I like so darn much. Russel Brand, eh? That's really cool! And seeing them shoot a scene is so exciting! You are so much classier than I am, Al. I would have marched straight into the bakery like a total dork, plopped down at the table, demanded a picture, discussed life in genera,l and would then ask if he would like to be an adopted father figure/mentor for me. You handled it much better than I would have, indeed. It took all of my willpower to not do EXACLTY that, Miss E. I think the fact that I had to get back to work helped to resist temptation. But oh man, knowing that Stanley Tucci is not my father figure/mentor/life couch makes me just a little bit sad. Think of how much more awesome my life would be with Mr. Tucci in it?! Ah!